Quotes are passages taken from plays, sonnets, or poems and reproduced here for reference and enjoyment. Notes are written by me, and examine a variety of issues in some of the passages drawn from Shakespeare's works. A full archive of Notes can be found here. Figures of speech – rhetorical elements that are present in the quote, e.g. Metaphor. 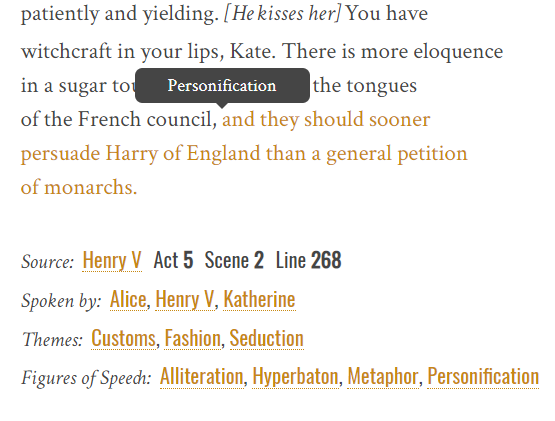 Additional Tip: If figures of speech are listed beneath a passage, then by hovering the mouse pointer over the passage, those figures will highlight and labels will identify them. Note that this site is a continuous work-in-progress, and new quotes and notes are periodically added, cross-referenced, and made more complete as I read and re-read Shakespeare's works. I encourage you to click around! The menus at the top of the site contain links to some good places to start. 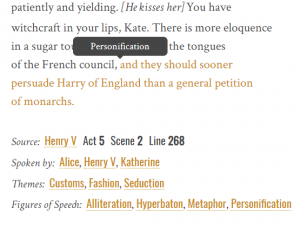 In addition, at the bottom of each page you'll find drop-down menus which display quotes and notes by organized by title of work, character, themes or figures of speech. If notes appear beneath a passage, they may link to other passages, which may in turn link to other notes. Follow the links to explore more information about Shakespeare's writings. Both quotes and notes can be discovered via the Search & Filter Quotes & Notes tab at the top of each page. This tool allows you to perform complex searches and filter by any criteria attached to the quote or note. To search all content on the site (not just quotes & notes), use the search field found in the right sidebar on most pages. There are a number of ways to navigate the three Shakespeare Timelines. You can click to the left or right of individual events to move forward or backward in time. You can click on individual events in the timeline ribbons that run across the bottom of the screen. These ribbons divide events into four categories: cultural, political, scientific, or Shakespearean. You can also hover the mouse pointer over the ribbons and scroll the ribbons left or right. At the left of the ribbons, you can enlarge or reduce the size of the events within the ribbons. Some images will enlarge when you click on them. This is especially useful when text appears in the image. Plan to use content you find on this site? If you'd like to use and/or quote any content from this website, please attribute that content to www.myshakespeare.me, and if possible, link to the site. Thank you!